In his acclaimed book Teach Like a Champion, Doug Lemov shared 49 essential techniques used by excellent teachers. In his companion Field Guide, he further explores those techniques in a practical guide. With the Teach Like a Champion Field Guide, teachers will have an indispensable resource that complements their classroom application of Lemov's techniques. The activities are designed to accompany the practitioner on the journey to become a champion teacher. The activities span three stages: learning the techniques, preparing to use the techniques, and actual practice. In addition to developing and sharpening teaching techniques, the activities provide a proven system for assessing outcomes. The book includes thirty new video clips of champion teachers with analysis from the author. It also includes helpful charts for teachers to track their own progress and to record feedback from colleagues. Most importantly, by using the Field Guide, teachers will be prepared to successfully unlock the talent and skill in all their students. Teach Like a Champion Field Guide is a must-have workbook for every teacher, from beginner to veteran. The workbook is also a great tool for professional development. 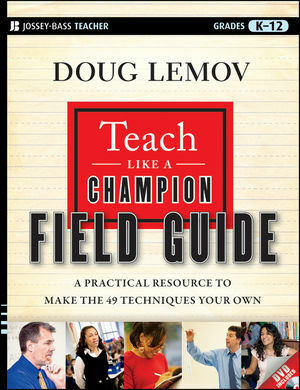 To learn more about Doug Lemov's ongoing work, visit his new blog, Teachlikeachampion.com!